We offer many free diversity and equity workshops for the campus community. 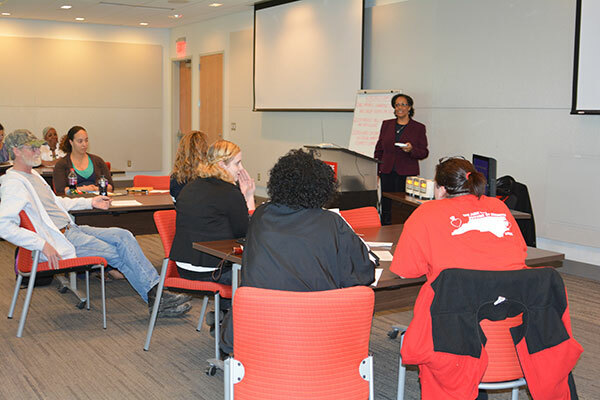 NC State faculty, staff, and students may register for OIED sponsored workshops in REPORTER. This workshop provides an opportunity to expand the knowledge participants have gained about the policy of affirmative action. A historical overview of the policy is explored, as well as the legal obligations of federal contractors with regards to affirmative action. Often, misinformation, miscommunication, and myths surround the concept of affirmative action, which will be clarified in this workshop. Participants will learn about the various individuals and groups involved in shaping the policy of affirmative action as well as the actual implementation of affirmative action in a selection decision. To register, please visit REPORTER. The responsibility for implementing the Americans with Disabilities Acts (ADA) employment provision, Title I, falls largely on unit managers and/or departmental supervisors since they are responsible for recruitment, pre-employment screening, and other workplace practices that affect the hiring and retention of workers with and without disabilities. The purpose of this course is to focus on correct and lawful employment practices that will minimize workplace discrimination for persons with disabilities. To register, please visit REPORTER. Applied Skills in Equal Opportunity builds on the basics learned in the Fundamentals of Equal Opportunity course. This application-based session offers participants the chance to practice interpreting equal opportunity-related laws, identify prohibited conduct, and enhance their response strategies. The format of this course is designed to promote discussion and questions are encouraged. Case studies will be used to demonstrate concepts, but participants are welcome to develop examples they wish to see addressed. To register, please visit REPORTER. In contrast to the popular conception of class inequality as the outcome of an individualistic, meritocratic process, we offer a competing conception based on the exploitation of human labor and labors struggle to overcome it. In this lecture style workshop, we examine how and why class inequality has been increasing rapidly today. We also see how class inequality works to prevent the achievement of racial and gender equality. To register, please visit REPORTER. Learn more about the laws that the U.S. Equal Employment Opportunity Commission (EEOC) enforces and how the organization operates and handles charges. You will also hear case studies and gain insights into how to avoid employment discrimination. An EEOC representative presents this workshop. To register, please visit REPORTER. The right to choose where one resides is the fundamental right of all American citizens. It wasn’t until Dr. Martin Luther King, Jr., was assassinated on April 4th 1968 that President Lyndon B. Johnson was able to urge Congress to move forward on the passage of fair housing legislation. Approximately one week later, just before Dr. King’s funeral, Title VIII of the Civil Rights Act of 1968, better known as the Fair Housing Act, was signed into law. This workshop will be an interactive discussion on the federal Fair Housing Act (FHA), individual rights under FHA, how and who to contact for help, and current issues related to housing discrimination. To register, please visit REPORTER. NCBI’s award-winning Controversial Issues Process trains leaders to deal constructively with tough conflicts, enabling them to move disputing parties toward future cooperation. Participants learn to reframe controversial issues into a context where all parties are able to work toward a common solution. The skills taught in this workshop can be used by anyone in any conflict situation from simple misunderstanding to heated debate. This workshop was formerly NCBI Building Bridges: Leading Diverse Groups Through Conflict. To register, please visit REPORTER. This training is intended for professionals who want an introduction to addressing issues they face in interactions with students, faculty, staff, and others from different cultures. In this two-hour workshop, participants will 1) Identify the cultural challenges in their professional role; 2) consider personal and others’ cultural preferences and values 3) Review key cultural values in a professional context and 4) Apply lessons to complex cultural scenarios. To register, please visit REPORTER. This course is intended to provide participants with a fundamental understanding of equal opportunity and affirmative action laws and policies. The session will outline relevant laws such as Title VII, Title IX, and the ADA, including the groups protected by each, and it will touch on corresponding institutional policies. Participants will learn how to identify discrimination, harassment, and retaliation will be exposed to examples of how prohibited conduct may appear in a professional or academic environment and will highlight relevant case law on these topics. This course also includes a brief explanation of how affirmative action works in both the employment and academic contexts. To register, please visit REPORTER. CONFLICT is a word that strikes fear in the hearts of most people. Unresolved conflicts, with the added dimension of diversity, including racial/ethnic differences, sexual orientation, gender, and religion to name a few, prevent positive, sustained personal and professional growth. Participants look at the world through their own set of spectacles, or perceptual filters, comprising what they have been taught and what they have seen, heard, and experienced. These perceptual filters are lenses through which everyone looks at differences such as race, ethnicity, gender, and nationality. This interactive session offers ideas and skills to assist university faculty, staff, and students in addressing the management of negative conflict in proactive, constructive ways. Various methods, including appropriate diversity training, coaching, group facilitation, and mediation are showcased and discussed. To register, please visit REPORTER. learn to reframe controversial issues into a context where all parties are able to work toward a common solution. This workshop provides answers to the following questions: Who are the “aged”? What are the basic facts and common misconceptions about the aged? What is ageism? What are the different types of ageism? What are the causes of ageism? What are the major consequences of ageism? How can you avoid ageism? How can ageism be reduced in the workplace? To register, please visit REPORTER. Through this workshop, participants learn the definition of the term disability with respect to an individual, Section 504 of the Rehabilitation Act of 1973, and the Americans with Disabilities Act of 1990. In addition, participants learn what the laws require, engage in dialogue and gain insight into the experiences of persons with disabilities. To register, please visit REPORTER. Through this session, participants learn the definition of national origin and how it relates to ethnicity and culture. Participants also identify cross-cultural mis-communication and gain insights into foreign nationals experience in the United States. Participants in this session gain an understanding of culture, cultural awareness, and the relationship between assumptions, values, attitudes, and behaviors as they evaluate their own cultural values and learn tools for promoting positive interaction with foreign visitors. To register, please visit REPORTER. Workshop participants learn the definition and use of the term race within the United States and how color relates to definitions of race and the perception of others. Participants examine cultural and racial misinformation, racial prejudice, and stereotyping as they gain an understanding of the laws protecting the classes of race and color. To register, please visit REPORTER. Participants learn about discrimination on the basis of religion and explore several religions, gain insights into how individuals and groups experience religious discrimination and obtain strategies to help eliminate religious discrimination. A panel of representatives from different religions makes this workshop an invaluable opportunity to gain information. To register, please visit REPORTER. This workshop will allow you to gain self-awareness, stretch beyond your comfort zone, and gain new understanding. The unique workshop is interactive, experiential, and high energy. Participants are both teachers and learners. The full workshop lasts approximately six hours, during which participants will engage in small group and large group discussions. In this workshop, you will: celebrate similarities and differences, identify misinformation about other groups, identify and heal from internalized oppression, claim pride in your own group identities, gain empowerment by learning ways to challenge bigoted comments and actions. This workshop was formerly NCBI Building Bridges: Strengthening Leadership for Diverse Communities. To register, please visit REPORTER. While engaging in a circle process, participants will explore the foundations of restorative and transformative community. The session will include a short discussion about restorative community building and the ways that restorative practices can support healthy and purposeful group/organizational discussions. Each circle session will focus on an equity and inclusion related topic and invite participants to examine their own narratives in relationship to others. After completion, participants will have a basic understanding of the “anatomy” of a circle process and will receive an invitation to continue exploration of restorative and transformative communities of practice. To register, please visit REPORTER. In the field of higher education today, it can sometimes be easy to overlook worldview as an important aspect of diversity. Students come to college with an array of worldviews (i.e., religious, spiritual, or non-religious outlooks on life) and helping them build skills for interfaith cooperation is important in our efforts to provide holistic learning and development. This session is therefore intended to begin a conversation about worldview diversity in college. Researchers from NC State’s Higher Education Program will introduce attendees to a national study of interfaith engagement in college that is housed in the College of Education. At the heart of the study is the Interfaith Diversity Experiences and Attitudes Longitudinal Survey (IDEALS), which has been administered to students at NC State. Findings about NC State students’ perceptions of their campus climate for worldview diversity will be presented alongside national findings, and participants will be encouraged to share their experiences with worldview diversity at NC State. The presentation will conclude with a discussion of recommendations for practice and strategies for improving the climate for worldview diversity on this campus. To register, please visit REPORTER. Often when individuals hear Title IX, gender equity in athletics is the first thing that comes to mind. Title IX of the Education Amendments certainly does involve ensuring gender equity in athletics, but it also works to ensure gender equity in academics and employment. Join this course to learn more about the history of Title IX, progress Title IX has made, and Title IX’s presence in educational institutions today. To register, please visit REPORTER. Unconscious bias acts below awareness and can influence our decision-making. This course introduces the basics of unconscious, or implicit, bias and reviews of different types of unconscious bias. Participants will engage in group activities and small group discussion while they learn how implicit bias influence their decisions in their university life. Finally, the participants will be introduced to scientifically sound strategies to combat bias in their own lives. This course is open to any and all participants – previous understanding not required. To register, please visit REPORTER.